Andrea Dovizioso claimed the final MotoGP victory of 2018 at the Valencian Grand Prix, finishing ahead of an on-form Alex Rins and a stunning result for Pol Espargaro as the Spaniard took his first premier class podium and the first for KTM in MotoGP. The dramatic race was red-flagged and restarted in heavy rain at the Circuit Ricardo Tormo, and saw a large number of riders fall foul of the tough conditions - not least reigning Champion Marc Marquez and Movistar Yamaha MotoGP duo Maverick Viñales and Valentino Rossi. But the show had to go on - delay notwithstanding - and go on it did. On the original start, Rins had destroyed the field to gain a huge lead after only a couple of corners, and the rain was falling but not heavy. The conditions remained difficult, however, and a good few big names - including some wet specialists - found themselves sliding out. They included a highside that skittled Marquez into the gravel from podium contention, and a high-speed tumble for Viñales after a good initial getaway. Pol Espargaro crashed out of fourth at turn three after a stunning start, but he was incredibly able to re-join. Brother Aleix Espargaro, Jack Miller, teammate Danilo Petrucci and Andrea Iannone also all crashed out and couldn't get back in it, but Rossi? At that stage, he was only getting faster as the rain was getting worse. The front row held station as the lights went out for ‘race two’ and all 16 riders safely negotiated the opening exchanges, with Rins leading. However, Dovizioso was once again able to get the power down on his GP18 to slice past Rins heading onto lap two - with Rossi in close pursuit. The three leaders quickly gapped fourth place Espargaro by 2.9 seconds, and Pedrosa tucked in behind the KTM in fifth. By then, the rain was starting to fall once again and conditions were still incredibly tough. Nevertheless, the leading trio were all lapping in the low 1:43s - two seconds quicker than anyone else as it soon became a three-horse-race for the final win of 2018. On lap six, Dovizioso then pulled the pin to create a one-second gap back to Rins – a 1:49.921 creating that gap, with 1.5 seconds then splitting the trio. Another fastest lap soon followed for Dovi, as Rossi made his move past Rins at Turn 4 - 1.5 down on Dovi. 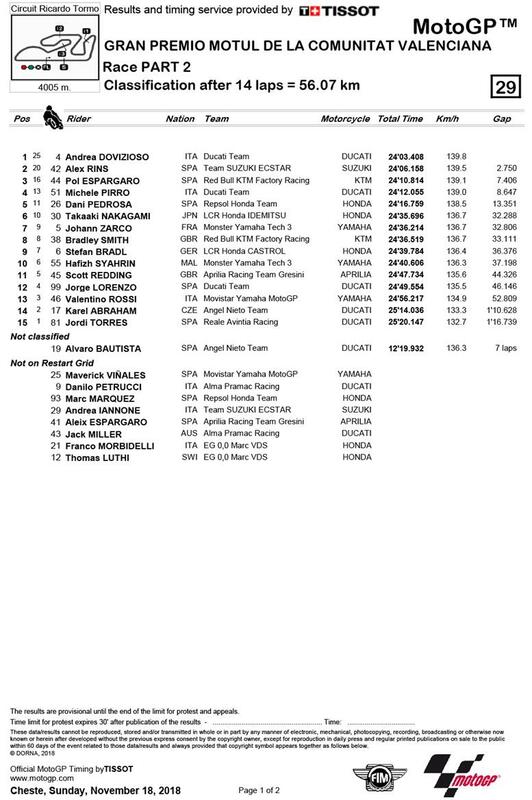 However, with six to go, the gap was up to 2.4 and a lap later, the Ducati rider's lead was over three seconds. But then, the drama hit again and Rossi was down at turn 12 - rider ok, but lifting Espargaro and KTM up to a podium place. 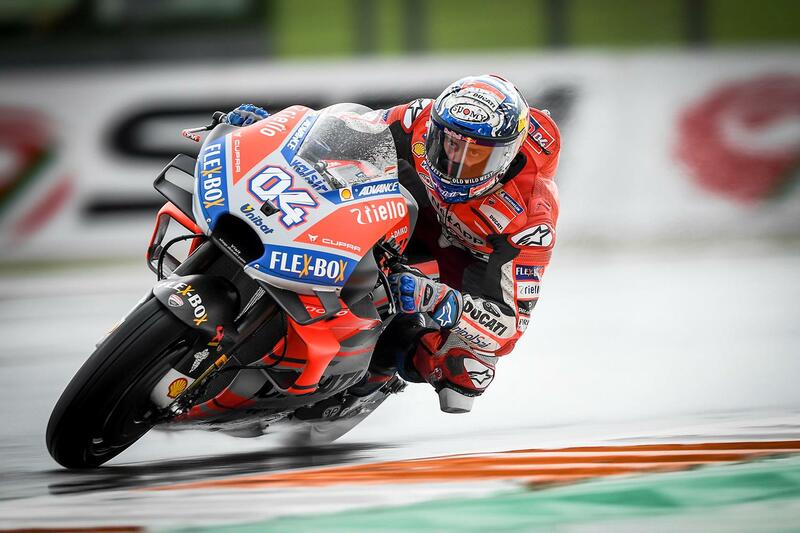 As the last lap began, Dovizioso's advantage was four seconds to Rins as both safely waded their way to the finish line – the Italian taking his first win since Misano and Rins grabbing a fifth podium of the year to claim fifth in the Championship. Then, emotional scenes followed as Espargaro kept Michele Pirro at bay to take both his and KTM’s maiden MotoGP podium – phenomenal from rider and factory alike after the number 44 rider had crashed earlier, remounted and duelled both Repsol Hondas. After a difficult season for the Austrian marque with injury struggles, it made for an incredible dose of oxygen, so said Espargaro. Behind him and Pirro came the new MotoGP Legend: Pedrosa. He took home a hard-earned fifth from his farewell Grand Prix ride on home soil as he helped Repsol Honda secure the triple crown. Behind the three-time Champion was fellow Honda rider Takaaki Nakagami, the Japanese rookie taking home a career-best sixth as top independent rider in the race, with Johann Zarco taking the overall 2018 independent rider honours after crossing the line in seventh. The Frenchman held off Bradley Smith, who grabbed his best KTM result on his final ride for the team. Replacement rider Stefan Bradl crossed the line in ninth, with Hafizh Syahrin rounding out the top ten - a great ride, but not quite enough to beat Morbidelli to rookie of the year. On his final Grand Prix appearance, Scott Redding claimed a season-best 11th, with Jorge Lorenzo bringing his Ducati career to an end with a tough 12thon the comeback from injury. Rossi remounted to ride to 13thand third in the Championship is the nine-time World Champion’s, with Karel Abraham and Jordi Torres claiming the final point-scoring positions. Alvaro Bautista crashed out of his final Grand Prix race with seven to go – rider ok.